Tyrolean landscape painter Leopold Scheiring spent his life working in Innsbruck. Like many Austrians living in the Alps, Scheiring was an avid mountain climber and had a deep passion for depicting views of the beautiful peaks around his homeland. He was especially fond of winter landscapes, in which he focused on the pristine quality of light one can only experience at high altitudes on the reflective snowy peaks. A self-taught painter, Scheiring was involved in the local Kunstgemeinschaft, or artist community, which allowed him the opportunity to exhibit his paintings, works on paper, and poster designs to the public. Scheiring disappeared in 1927, after which he was neither seen again nor confirmed deceased. Likely painted between 1915 and 1920, Gewitterstimmung im Haller Anger depicts a peak in the Tyrolean Alps Scheiring likely climbed himself. The painting stands as a uniquely moody and decorative work in the artist’s oeuvre. Using an almost pointillist technique, Scheiring illuminates the tree and the rocky knoll with tiny dabs of bright yellow paint, flattening the foreground to create a surreal perspective. 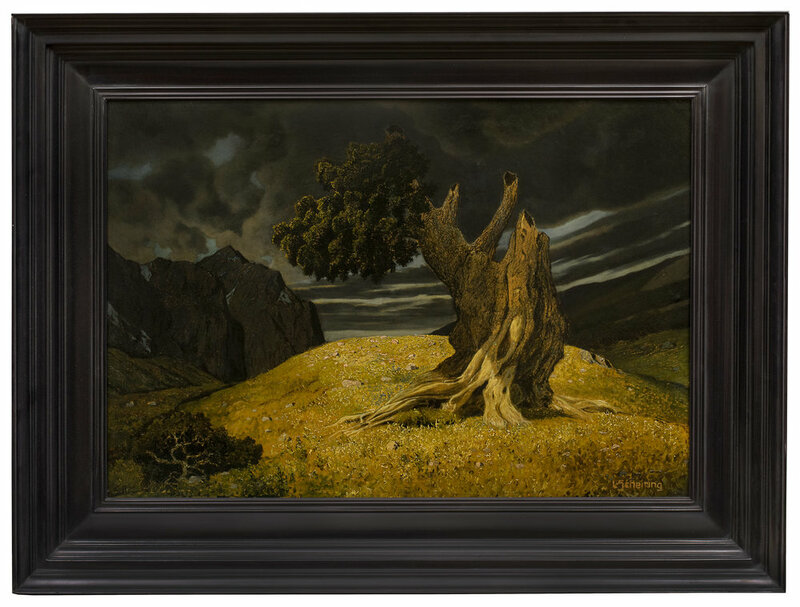 The painting reflects an exceptional mastery of light and shadow and highlights the artist’s ability to imbue the landscape with anthropomorphic emotion.